A Boxful of Puppies, this Norman Rockwell painting, appeared on the cover of American Boy published April 1920. An alternate title for this picture is Boy with Dog and Box of Puppies. This was the fourth picture by Rockwell to appear on the American Boy cover. 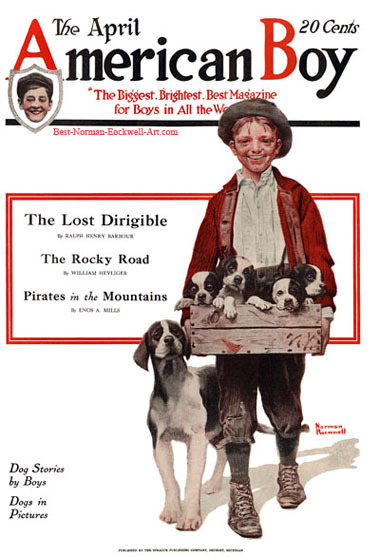 American Boy only published five Rockwell covers, between 1916 and 1920. Clearly, Rockwell's first choice for publication was The Saturday Evening Post. He believed that the Post cover was America's biggest showcase window for artists. Of course, his career confirmed this. In this painting, Norman Rockwell captures three of his favorite subjects. In his early works, he appeared most at ease painting children, dogs and, yes, puppies. These puppies do not appear to be newborns. Their eyes are wide open and bright with feeling. You can almost see them squirming to get out of that box and onto the ground to run around. The proud "father" of this litter, the boy, is hauling the pups around in an old wooden shipping box. A remnant of the shipping label is the red patch on the front of the box. "N.Y." is written in the bottom right corner of the box. Is he giving puppies away? Is he taking them to visit some of his friends? The mother dog follows along, ever nervous and concerned when her pups are moved. She is watching their every move, keeping pace with the boy. I'm sure she has mixed feelings about her puppies being given away. On the one hand, she will undoubtedly miss her babies. On the other, she will have her boy's complete attention back.